The Jewish Ghetto is one of the most recommended place to visit in Rome. Built in 1555 by Pope Paul IV (40 years after the Ghetto of Venice, the most ancient in the world) it became the core of the Roman Jewish community, a poor and densely populated area near the banks of the Tiber. As the Jewish people were not allowed to own real estates, there wasn’t a careful maintenance of the buildings: the houses were real hovels and many of them were destroyed when the Ghetto was abolished. You can find many attractions in this neighborhood full of history, starting from the Jewish Museum of Rome, opened in 1960. With its Medieval and Renaissance ruins, Via del Portico d’Ottavia is the symbolic centre of the Ghetto together with Piazza delle Cinque Scole, an architectural hybrid surrounded by Umbertino-style buildings. You can admire San Gregorio della Divina Pietà, a small church entitled to Pope Gregory I, who gave the Jewish people the freedom of worship; Ponte dei Quattro Capi, a small bridge that connects the Ghetto to the Tiberina Island; the Synagogue, one of the biggest Temples in Europe, build between 1901 and 1904 and Fontana delle Tartarughe, one of the most beautiful fountains of the city. 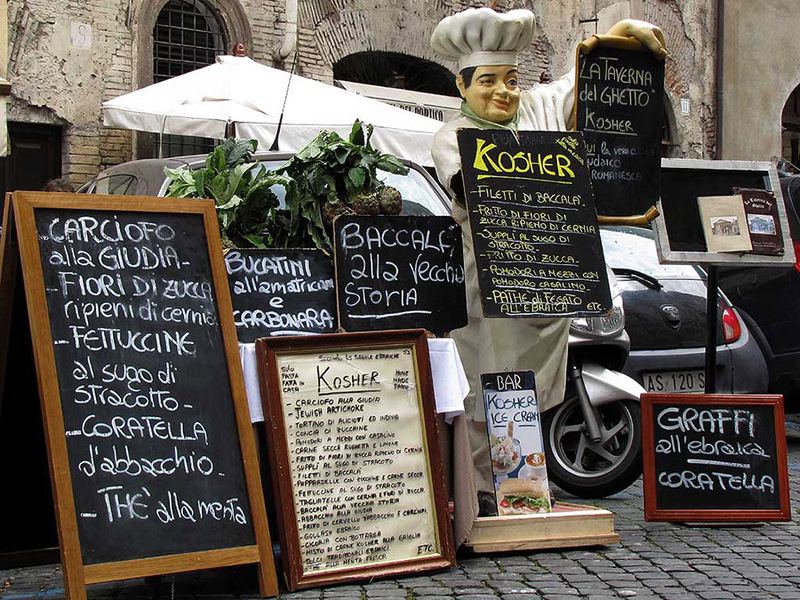 And don’t forget to taste the typical Roman-Jewish cuisine and Kosher food!